Yassmin Abdel-Magied is a Sudanese-Australian who migrated to Brisbane at the age of one with her family after the democratically elected government was toppled by an Islamic military coup during the Second Sudanese Civil War. She is a mechanical engineer, author, activist, keynote speaker and part-time radio presenter. At age 16 she founded the nonprofit organisation Youth without Borders. She was the 2015 Queensland Young Australian of the Year, and formerly hosted the Australia Wide television program on Saturday mornings on ABC News. She has held membership in the Council for Multicultural Australia, Federal ANZAC Centenary Commemoration Youth Working Group, the 2014 Youth G20 Summit, and the Council for Australian-Arab Relations (CAAR). In this inspiring and thoughtful interview with Leadership Space’s Barb Barkley, she talks about how she thinks about issues of gender, race and leadership, and how we might all be able to contribute to a better world. An interview to put a spring in your step. Learn more about our career coaching, and organisational work. Yasmin’s book “Yassmin’s Story” can be found here. Barbara Barkley: Hi welcome to Leadership Space’s podcast series: conversations that shape us. My name is Barbara Barkley and as well as having the delight of working with Elise Sernik, the founder of Leadership Space, I have the pleasure of bringing to you to today, our conversation with Yassmin Abdel-Magied. Before stepping into this podcast, I’d like to give you a little bit of information about Yassmin. She’s a growing voice as a strong, female Muslim leader in Australia. She’s already been named Young Queensland Austraian of the Year and Young Muslim of the Year. Yassmin was born in Sudan before her family moved to Brisbane when Yassmin was two. Yassmin describes her background as ‘all around delicious with Sudanese, Moroccan, Turkish and Egyptian heritage’. We share insights around a topic of great passion to Yasmin – that is of diversity and raising awareness of unconscious bias. Yassmin’s also just launched her book, Yassmin’s Story, which we share insights with you about how to access that on our Leadership Space website. I take up the conversation with Yassmin at the time way back when, when she was 16 and founded her organisation Youth Without Borders. I hope you enjoy listening to Yassmin as much as I enjoyed sharing time with her. Barbara Barkley: So as a 16 year old, you’re a Founder of Youth Without Borders! Yassmin Abdel-Magied: Of Youth Without Borders, yeah! And it’s funny because at the time, and in the years after that, everyone would be like: “oh my god, it’s so amazing you started that!” But for me, I had something I wanted to do, so I did it. And it was a case. I think there’s also a level of when you’re that young, you just do things without thinking about it. You don’t have all the trappings of knowing what you don’t know. And everything for me. Barabara Barkley: So there was no fear involved? Yassmin Abdel-Magied: There was no fear. There was, I didn’t feel like there was a downside. I didn’t think well what if this didn’t work or what if this failed, it was this is just something we should do, I’m going to find a way to do it. And I think, that’s what I tell a lot of young people: use that passion you’ve got now just to, because as a 24 year old, it’s much more difficult for you to go and start something because you just think about stuff so much. Not that you shouldn’t go out and something but there’s just an added level of complexity that we bring to it. And I suppose it was, there was never one moment in particular but there was sort of this realisation over time, that I was being given a platform and that was a responsibility and a responsibility that I needed to make sure I honoured. Barbara Barkley: One of the things that I have read about you was that at an early age, your mantra was ‘change the world for better’. Is that still the philosophy and what you espouse now? 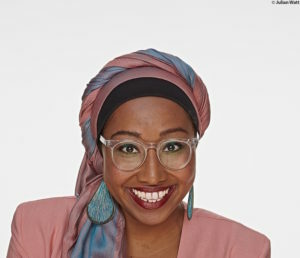 Yassmin Abdel-Magied: I think, I don’t necessarily sort of go through my life thinking that I want to change the world because I think that, and I read recently that somebody said, you know they’re a bit wary of people who say they want to change the world because that sort of comes with maybe, perhaps a level of naivety about what that will take. But I think and this is something that I’ve realised over the last couple of years, I want to make sure that my influence in life and every interaction is a positive one and that wherever I am, I’m useful. I just want to be useful and in whatever it is that I do, I just want to make sure that I’m not wasting space, that I’m adding value and I think bringing that, wanting to add value, wanting to have a positive impact in whatever space that you’re in. If you’re philosophy is about the outcome, will the end ever justify the means? I’m not sure and I think sometimes we get so caught up in looking at what the end is, the end outcome, the end objective, when it’s just as important to ensure the process that we do things through is also ethical and is also doing it in a way that’s positive. But ultimately, you’ve got to have some principles that you stay true to. Barbara Barkley: So, and right now, one of the areas and messages that is very strong for you to share, is the conversation of diversity and the importance of increasing people’s self-awareness around unconscious bias. Can you share some of your perspectives on that topic? Yassmin Abdel-Magied: Sure. It’s, the topic of unconscious bias for me is fascinating because I grew up like I think a lot of people in my generation, kind of thinking that the fight had been fought. You know, particularly when it came to gender, that, you know, life is fair for women and for men and we didn’t really need to think about it too much. Why would you need to be a strident feminist because, you know, that was something of generations ago. And I think over time, particularly in the spaces that I inhabit and work, you sort of realise that actually, although the legislation may have changed, our society still battles with patriarchy, battles with, I suppose, a level of monoculture at the top echelons of society so there’s still a particular demographic that really holds the strings. And so, I think, realising that over time and then realising that if we need to change that then we also need to change the type of conversation that we’re having and also bring people into it was how I sort of came into the space of unconscious bias. Because I knew that if I ever talked to the guys I worked with about, you know, straight out racism or straight out sexism or whatever, people don’t want to think they’re sexist or racist. People want to think that they’re good people. By and large, everyone thinks that they’re a good person. So how do you say to someone the behavior that you’re exhibiting or the system that you’re operating in is actually structurally unequal? The reality is that we don’t live in a world that is fair; we don’t live in a world where people have equal opportunity so how do you show people that? And how do you make people realise that they are operating in that world and may be contributing in that world? So you talk to them about unconscious bias and something I say to people is that unconscious bias is not about conscious discrimination. It’s not about saying that you are racist or you are sexist but it’s about recognising that a) we live in structures and systems that do have racism and sexism within them but also that we all contribute that and we can also contribute to dismantling those structures. Barbara Barkley: So tell me that then, what are some practical examples, particularly in the social purpose sector because that’s a lot of who our listeners will be, to actually create greater diversity and improve people’s self-awareness around unconscious bias in their cultures? Yassmin Abdel-Magied: I think ultimately, one of the things I’ll start off with is just giving people an example and people have probably heard this before. If they have, I apologise but if not, it’s a good example of how we see unconscious bias. And the story, it’s a story, essentially where there’s a young father and his son driving along the highway and they get into a tragic car accident and the father dies on impact and the son is severely injured and they rushed him to hospital. The surgeon looks at the boy and is like: “I can’t operate”. Why? “This boy is my son”. Now, often people think: “well how can that be, didn’t the father die?” And you take a few moments and then you realise: oh the surgeon is his mother. Now often, when I tell this story, you see people’s faces change because they’re like: “Oh my gosh, I didn’t think that I held any bias”. But the reality of the situation is, you don’t ask a fish about water because it’s all around them, it’s all around them. They don’t even realise that the water’s there. In the same way, when we think about structures that are patriarchal and so on, it’s all around us, we don’t even realise that, we don’t even realise that it’s influencing our decisions. I think it’s really important also, and this is something that I am beginning to also understand, that we need allies, like when it comes to gender, when it comes to people of culturally linguistic and diverse backgrounds, we want to get diversity in places of influence across the board, we do need allies, we do need. And I’ve only been able to access the spaces that I have because I have had mentors and sponsors and allies. So I think, none of what I ever say is ever meant to make people feel guilty. It may make people feel uncomfortable but I think that’s okay because I think being uncomfortable is where you do the best learning. If you’re uncomfortable you know that you’re growing, you know that you’re challenging your beliefs. Barbara Barkley: When there’s change there’s resistance. Yassmin Abdel-Magied: Exactly, so I encourage people to sit with their discomfort and to kind of try to understand why they’re uncomfortable or why they’re experiencing discomfort and learn from that. When it comes to practical things, I often give a few people, or give people ideas on how to be ‘quote on quote’: good allies. One of the things I often talk about is this idea of mentoring or sponsoring someone who’s different. It’s really easy for us, you know, for people in positions of power to find connections with people that share similar experiences, whether it’s loving the same football team or going to the same school or whatever it may be. We find points of connection and that’s how we create tribes, that’s how we create community, right? Because you connect with people based on seemingly innocuous things but that’s how it happens. However, if somebody doesn’t have a shared experience, if somebody is coming from a completely different world, if someone is a Sudanese born, Muslim girl who went to like a primary school that was all for Muslims and doesn’t actually know much about AFL at all, how is she going to connect with someone who doesn’t have any similar experience? So I often encourage people in places of power, or people who are leaders in their own space, to find people, to actively go out and find people who don’t share that same experience. And then also, sometimes, it’s more difficult to do that but it doesn’t mean that it shouldn’t happen. I was recently given an example where somebody said: “Look, you know there was a position for a gender equality officer and the only person that applied was a young Anglo-Saxon man and we hired him because he as the only person that applied and then we got all this flack because how can a guy be a gender equality person?” And I said to him: “well, did anyone stop and think maybe if this isn’t the person they wanted for the job, that they should go out and look for a person who was a female, who was, perhaps, a woman of colour?” And genuinely this person looked at me and was like: “oh, I never thought about that”. I think people forget that, just because an opportunity is there on a website, it does not necessarily, like there are all sorts of blockages that start way before a person puts in an application. You know, a woman might think, well I’ve never got a chance at that job and there’s so many studies that talk about the fact that women put forward their name for something they’re 8 out 10 criteria applicable for and a guy will put their hand up for a job that’s like 5 out of 10. You know, there’s all these studies that say that women don’t back themselves as much or, you know, maybe actually this woman doesn’t, the right ‘quote unquote’ woman for the job may not even have access or know those opportunities are there. One of the guys said to me: “what if a woman applied, a woman of colour applied and she was not as qualified?” And my question was: well how on earth is that woman ever going to be qualified, if you don’t take a chance on her, if you don’t go out and then say I’m committed to gender diversity. I’m committed to diversity to the point where I will take this person under my wing and train them and show them the way because right now, you know, the other bloke may currently tick all the boxes but that’s because he has had a lifetime of privilege. So I think it’s recognising also that there are so many different types of privilege that people have access to. And you know, I’ve the privilege of good education and parents that knew the system and so on and so on. So it’s my responsibility to go find other people who don’t have the kind of privilege and train them up. So it is more difficult but at the end of the day, if we are committed to this concept of diversity, if we are committed to saying: “we want our boardrooms and our television and our parliament to reflect the society that we live in”, then we have to put in the extra effort. I mean there are other small things. You know, think the language that we use. Barbara Barkley: Well tell me about that. I mean, there’s often the standard that actually if you let something go, then you’re allowing that to be the level of conversation. Yassmin Abdel-Magied: Yes, definitely. The standard that you walk past is the standard that you accept. And you know that is incredibly true and how often do we all do it? How often do we let innocuous, seemingly innocuous jokes slide or seemingly innocuous decision to be made? I remember, a senior executive in a company that I was working for once said that she was on a panel for, like they were hiring some people…oh they were doing some promotions and there were two candidates. Relatively equally sort of based: one a guy and one a woman, a male and a female. The guy, they were like: “oh it seems like he has plenty of potential, let’s double promote him”. And then they were like: “oh this woman, seems like she has achieved a lot but we’re just not sure if she’s ready so we’ll only promote her once and the promotion won’t be as great”. Now the person telling the story was like: “usually I would have let that pass but then it occurred to me that I’m in a situation where I can make a lot of difference and I can point out what is going on”. So often, it’s about checking ourselves and checking the people around us, it’s even things like. I often talk about women in male dominated industries; particularly about women in engineering and some research has shown that there are four ways in particular that gender is dealt with negatively in technical spaces. The first one is about highlighting gender so essentially, the example I always use is: I walk into a room and the blokes will be like: “alright guys, no swearing, there’s a female in the room”. Now that may come from a place of good intentions, but what it does is it highlights difference and it reminds everyone that hey here’s somebody who doesn’t belong in our group or hey here’s somebody who we have to do something special for to belong in our group so therefore she can’t be an integral part of the group. It’s so small and subtle but it highlights difference. The second is assigning gender roles. So it’s the small things like the woman constantly doing the minutes or the woman you know, giving out the food when the food arrives at a meeting. The small things like that, office housework. Stuff that essentially plays into a traditional, stereotypical gender role and so people then associate the female with those things as opposed to necessarily thinking about her as their equal or their peer. The third is that women are tuned out at meetings and this happens all the time without us even realising it. We might be in a meeting and there’s a bunch of blokes and a couple of women and the woman will say something. She’ll posit an idea and it’s as if people won’t hear it and then a couple of minutes later, a bloke may say the exact same thing and everyone will be like: “Joe, what a mad dude, great idea”. And it’s amazing because this happens so often and every time I say this example in a speech, I can see people in the audience nodding but we don’t make a point of calling it out. We don’t make a point of saying: “Hey, hey, hey it was actually Mary or Fatimah’s idea” right? So I think it’s incredibly important that when we see examples in our daily life of those small things, and they may seem small, but those small things are what allow or what essentially make our environment what it is. It’s the water around us. So if we let those things pass, then it won’t be as surprising when we don’t want to hire or we don’t want to promote a female. It won’t be as surprising if someone says: “oh well she might want to have a kid soon, so why don’t we just get the bloke instead”. And the fourth thing is, particularly for women engineers, is doubting technical ability. So it’s this idea of I may offer a technical solution but it’s not unless it’s corroborated by a bloke that people will be like: “oh yes, sure”. And the number of times, I mean obviously for me as a female, and also a young female engineer, it’s difficult for me to ascertain whether it happens sometimes because I’m young and inexperienced or because I’m a female. And it’s not so easy for me to sort of point things out sometimes but it’s definitely something the research has shown does occur. Barbara Barkley: So, I am going to play devil’s advocate now and say, why does it matter? Why does it matter to create greater diversity, whether it be in a social purpose sector environment, whether it be in any organisation. Why does diversity matter? Yassmin Abdel-Magied: Really good question! I think it’s also a question that’s in the mind of a lot of people, the back of the minds of a lot people. Barbara Barkley: Why go to all that trouble and try to change the way that I’m thinking because this is supposed to be good for our organisation. Why does this matter? Yassmin Abdel-Magied: There’s a couple of reasons. So firstly, the customer base ‘quote unquote’ that we’re dealing with – the people in our society are diverse. So we need to make sure that the decisions that happen, the decisions that are made in society are reflective of the people that you’re trying to serve. And also it’s just so much better. Like the research has shown that diverse teams make much better decisions and I can pull out numbers of, boards with women on them proving that they have x amount more money on the bottom line and so on and so on and so on. At the end of the day, a diverse team, and not just necessarily with a different gender or ethnic background – culturally and linguistically diverse backgrounds – but just diversity of thinking: an engineer and a doctor and a sociologist and a psychologist. They come up with completely different solution to three different engineers or four different engineers. We have to, like from a business point of a view, it is dangerous to have everyone around the table thinking the same way. That’s how you get groupthink, that’s how you get blind spots. Because the people, everyone’s like: “oh yeah, I agree with you”. “Oh yeah, I agree with you”. And then nobody ever challenges that. And you have to be challenged in order to make better decisions. So from a business point of view, diversity is required in order to make sure you don’t have the blind spots, in order to make your decision more robust. And in order to reflect the business, like the customers that you’re serving. And then from a society point of view, I think we miss out on so much, we miss out on so much when we think there’s only one kind of leader, when we think there’s only one kind of way of doing things. Like, imagine the possibilities if you had a young, indigenous girl leading the nation. Just imagine, imagine what it could be like if there was, you know, all sorts of nations and backgrounds and genders and sexualities and abilities and disabilities on our TV. Imagine the possibilities that could create. Because the way I see the world is completely different to the way someone with a different perspective sees the world and bringing those things together, that’s how you create innovation, that’s how new things happen. Barbara Barkley: And also there’s a visualisation and a role modeling that somebody actually sees someone like them in that role so it creates an empowerment. Yassmin Abdel-Magied: Yes, 100% and I say to people all the time: “imagine you are a young indigenous girl walking through parliament, for example, and you see all the leaders of the country. How on earth are you ever going to imagine that you could possibly be one of them when none of them reflect you or your experience?” It is incredibly powerful to have role models that, not even role models, just people in society, that you see in the media, who look like you, who share your experience, that you can in some way relate to because then that’s how you think: “oh, I can do that”. It opens up doors beyond and then and that is so exciting I think. And that’s why it’s important to make sure we have examples and spaces for diversity. Barbara Barkley: Tell me now, let’s progress into philosophies around leadership. Tell me how all the different personal perspectives and growth that you’ve had are influencing your leadership style now and the development you’ve had as a leader. Yassmin Abdel-Magied: Interesting question. I think my leadership philosophy ‘quote unquote’ is really strongly linked to a couple of things. One is to my faith and it’s not something I talk about often because I think religion is something that’s quite misunderstood in society generally and not really valued in Australia, in particular. But for me, my faith plays a role in the sense that I do everything not for me, but for a purpose that’s beyond me, right. And that purpose is an understanding that I’ve been provided with opportunities and gifts and that is not, that is not something that I am allowed to use selfishly. That is: one day, I will be asked: “I gave you these gifts, what did you do with them for society? How did you make the world better?” So these gifts and these opportunities are a responsibility for me. And I guess that’s much more philosophical but ultimately for me, every opportunity and every award, every platform is a space for me to use it for good. Maybe one day, I won’t be the best person for the job. I think being a good leader is also recognising when you need to step aside, when you need to provide an opportunity for someone else, when you need to swallow your pride and say: “actually you can do it better”. I think it’s such a humbling experience and it can, like I always say to the people around me: “please keep me grounded”. Because I think my fear is believing too much of the hype, right. Because as you sort of progress through life and you do more and more things and people start to give you pats on the back, you can start to believe that, you can start to believe you are so great and so infallible. But the reality is you are a person who is, and the reality is for me, I am a person who is where I am because of a whole bunch of things. Because of the people around me, because of the opportunities, because of the privilege and so that is not something that I can take for granted. And it can disappear at any moment, it is a fragile thing. And so to constantly be grateful for that, to constantly be, to treat that with kid gloves and essentially make the most of it while I can because nothing lasts forever. And I think having that in the back of my mind constantly and being constantly… And I think again, linking that to my faith, you know I am in this place because my God, Allah, wants me to be in this place so I have something to do here. Barbara Barkley: What I was hearing, and then you named it, was that your leadership is about service. So what is next for you? Hearing the service conversation and leadership conversation, you know, you’re such a optimistic person, what is the next place that you see your service being required? Yassmin Abdel-Magied: Good question. I don’t think I know but I think that’s okay. So I’m still, I’ve got a couple of balls in the air, so to speak. Obviously, I’m still in my fulltime role as a mechanical engineer, as a drilling engineer, so that takes up a lot of my time. And for me, a lot of people say to me: “well Yassmin, isn’t it time that you gave that up?” But for me, what that does, is give me a grounding but also a level of technical skill that I think adds depth to the work that I do. It also gives me access to a world that is a completely different social pace. So learning to speak that language, learning to be in that corporate space, in that technical space is very important to me. So I think I’ll definitely stick with being an engineer for a little bit longer. Also, I’m working on a book that will be published in Feb 16 / March 16 and that is essentially, I think, a conversation starter about a whole bunch of different things I think I will probably continue to talk about for some time. So I talk about a few things but one of them is, you know, the experience of growing up Muslim and migrant post 9/11 which is a n experience I thought people understood but apparently, you know and it makes sense if you didn’t have that experience, you wouldn’t know but, so kind of talking about what that looks like. Kind of also talking about the strength of women from ‘quote unquote’: the East. Because, you know, I grew up with amazing powerful women all around me but those are the kind of women people would look at on the street and thin are oppressed. So kind of, trying to tell a different story – women being incredibly strong and powerful in spite, perhaps, of the kind of environments they’re in. And also kind of talking about the space of women in male dominated spaces, what diversity looks like in a very multicultural society from a gender and race and religious point of view. So I think, for the next few years, I want to make sure that these conversations continue. It’s great to have this stuff have a bigger place. I think topics like feminism and unconscious bias and so on have really become en vogue in the last few years, which is awesome. So trying to make those conversations a little bit more mature, a little bit more sophisticated and that social change is so much more difficult but also quite powerful so seeing where that all pans out. And yeah we’ll just play it by ear I think, I’ve always kind of jumped on opportunities whenever they rock up so yeah, we’ll see where the next ones happened. Barbara Barkley: It’s a been a pleasure. Any final insights for our social purpose visionaries who are listening? Anything you want to share? Yassmin Abdel-Magied: I think something I often say to the school kids actually that I work with, is to never underestimate the impact they can have. And usually when I say that, it’s because they’re young people who might think that because they’re young, they can’t really do anything. And my message is to them is you know, I was able to start an organization at 16 – you can do that too. But even if it’s not that grand, you can influence the thoughts of the people around you. I think also for people leading their own movements, their own worlds, whatever world they inhabit, not to underestimate the impact you can have simply by changing your thinking, simply by changing your language, by offering an example that people may not have seen before. I think it’s incredibly important that we are self aware, that we become more self aware, that we try to think well how am I presenting myself – what kind of language and behaviors am I allowing gin my company, in my space, in my organisation? Am I letting certain jokes pass? I think for me, for leaders, its understanding that you’re no longer in the trenches cause its so much easier to be in the trenches essentially having the same kind of banter that everyone else has, having the same kind of attitudes that everybody else has. But I think to be a leader that truly changes things, you have to be a leader that others aspire to. There’s nothing more powerful than our actions to show the people that we’re trying to lead that the world should be a better place. Barbara Barkley: Yassmin! Yassmin Abdel-Magied it’s been pleasure to have a conversation that’s certainly shaped me and I hope it’s shaped other listeners on this podcast. Thanks so much. Yassmin Abdel-Magied: Thank you. Thank you so much for the opportunity, Barb and good luck everyone, it’s a wild ride.